Staying at this hostel was the best highlight of my trip to Berlin. I met boys from all around the world and we went out together to bars and clubs! The hostel itself is very cute and homely. Can’t wait to come back! 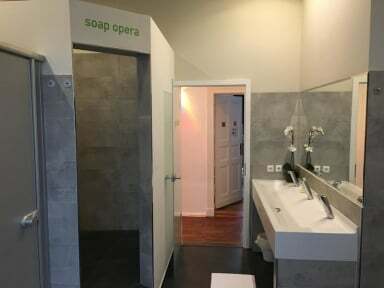 Great Hostel, very clean with a nice simple interior design and friendly people. I have to come back for more! Overall the environment is good. The hairdryer is given upon request. Very cozy hostel. Located right in the gay neighborhood. Bed was alright. Very friendly atmosphere. Had a great time with the people I met while stayed. Would definitively stay again. Very clean and relatively quiet hostel. I wasn't there a lot, but when I was, staff and other guests were friendly. For the places I ended up wanting to explore most, I wasn't in the best location, but that was due to my lack of knowledge about Berlin more than anything. Good sense of community at the hostel. I loved my time here. I met a couple of stellar guys and ended up having a real blast in Berlin. It is a bit of a grab bag for the type of guys that come there and that is just the nature of the beast. I would definitely recommend staying here if you are an outgoing and fun loving person looking to explore this great city, whatever that entails for you. Biggest 2 complaints are that 1. no "cleaning" stations 2. you don't get a regular sized towel at check in, just a little hand one. The hostel provides good atmosphere for gay men wanting to make friends and find people. My opinion that the location is good but it is far from the city center. So keep that in mind while booking. Very nice and clean hostel. If you just want to go out in gay area then location is perfect.